Click on the question to view answer. Why are there so many trucks and equipment along Eglinton Avenue and nearby side streets? In areas where work is concentrated, you may see several construction vehicles. Construction vehicles range from heavy operating equipment to smaller vehicles for transportation of signage and various materials. These vehicles all perform key functions. In some cases, vehicles may appear to be unnecessarily idling; however, it is important for vehicles and equipment as part of the immediate works to be ready to move in as required to perform the scheduled work. Construction-associated vehicles are exempt from City of Toronto idling legislation. Please be cautious when travelling near and around these vehicles and equipment. Who are the project players for the Eglinton Crosstown LRT project? Metrolinx is the owner of the project. Metrolinx determined the scope of the project, including schedule and budget, as well as the project specific outputs required for the construction of the Eglinton Crosstown LRT. Metrolinx also acquires lands needed for the project. Metrolinx continues to oversee design and construction works. Infrastructure Ontario (IO) manages the Province’s Alternative Financing and Procurement program which the station/stops constructor of the Eglinton Crosstown LRT was procured through. Additionally, they negotiated the project agreement that determines the role of each party. IO continues to oversee the implementation of the project agreement to provide quality control and oversight. Crosslinx Transit Solutions is the constructor chosen to build and maintain the Eglinton Crosstown LRT. They are a consortium of global and local leaders in urban transportation infrastructure: ACS, Aecon, Ellis Don, and SNC Lavalin. They will design, construct, and finance the 25 stations and stops, the tracks and signals, and the maintenance and storage facility. They will also maintain the LRT system for 30 years. Toronto Transit Commission (TTC) will be responsible the day-to-day operation of the Eglinton Crosstown LRT integrated as part of their transit system. Since the beginning of the project, Metrolinx and the TTC have worked in close collaboration to ensure the effectiveness of the project – and will continue to do so. How has the community been engaged throughout the project? There have been several points through the planning and design phases of the Eglinton Crosstown project for the community to provide input and feedback. The community at large was consulted through the Crosstown Environmental Assessment process. As well, community consultations were conducted with the Reference Concept Designs were complete, and also when the City prepared its Eglinton Connects planning study. Most recently, the community also had a say in the naming of the Eglinton Crosstown LRT stations; read about the process on our Metrolinx Engage website. The community continues to be engaged and informed by the Crosstown Community Relations staff in both of our Community Offices. We regularly work with a variety of stakeholders, such as residents, businesses, BIAs (Business Improvement Areas), community organizations, religious institutions and schools along Eglinton Avenue to identify and respond to issues and find ways to minimize disruption associated with construction. We participate in various activities throughout the year to increase awareness of the Eglinton LRT, provide relevant project updates, and to support the marketing efforts of BIAs and local businesses. What construction work is happening now? As of the end of 2016, work was underway at all 15 underground stations. Construction of the Eglinton Crosstown LRT stations has distinct phases, listed below. The method of station construction (mined, cut and cover, or interchange) determines the order of the preparatory works and how quickly the roadway will return to regular conditions. Learn more about the work happening at the station closest to you by visiting our Construction Updates page. Preparatory construction works for the street-level alignment of the Eglinton Crosstown LRT (between Laird Drive and Kennedy Road) are expected to begin in 2017. Work will occur in sections, beginning in the east and moving westward. How do you determine what work will happen at what time? The contractor works with various subcontractors to complete the project, and it is within the contractor’s control to choose the method and schedule for successful delivery based on their resources. The project requires ongoing coordination of sub-contractors and obtaining a variety of separate permits through the City of Toronto. Much of this type of construction work and coordination occurs behind the scenes. As with other road works, the road remains occupied with fencing and equipment which may continue to shift through different phases of the project. What is involved with excavation of stations? The first stage of constructing a station consists of installing supports (shoring) around the areas that will be excavated. Generally, shoring consists of installing large steel beams (called soldier piles) vertically deep into the ground at regular intervals along the perimeter of the station and the station's entrance. In between each vertical steel beam, horizontal supports (called lagging walls) are put in to help carry the load. Further, braces and ties backs are fixed along the sides to provide additional support. Shoring will be followed by deep excavation (between 20 to 25 metres) at each site. In densely populated urban environments, caisson piles might also be used. How are TTC bus stops and routes affected during construction? How are these decisions made? Metrolinx works very closely with the TTC to determine what stop relocations and/or re-routings are necessary to ensure construction can continue safely while minimizing impact on the community and TTC customers. Transit users are encouraged to watch for signs posted at the stops indicating a temporary change. They can also call 416-393-4636 or check the Service Advisories at www.ttc.ca. Transit stops with shelters that require relocation may not receive temporary shelters in their new positions. How is Metrolinx making sure areas around construction sites remain accessible? Metrolinx and its station contractor, Crosslinx Transit Solutions, ensure that areas around the construction sites comply with the Accessibility for Ontarians with Disabilities Act (AODA). In areas along the corridor where there are specific accessibility needs, we work with community groups to ensure we’re considering every option. What is being done to replace street parking removed due to construction? As many construction zones for the Eglinton Crosstown LRT are occupying lanes on Eglinton Avenue, on-street parking may be affected in certain areas. To alleviate the loss of parking in these areas of Eglinton Avenue during construction, Metrolinx, in collaboration with the City of Toronto, adjusted parking regulations on some side-streets to accommodate parking in neighbourhoods for businesses. What is Metrolinx doing to help traffic flow along Eglinton Avenue during construction? We acknowledge that traffic delays and congestion, safety, and infiltration of residential streets are long standing concerns in neighbourhoods along Eglinton Avenue. As construction reaches long-term phases for station and stop construction, residents and commuters can expect that routes will be much busier. Before a work zone is set up, traffic engineers from both Metrolinx and our constructor, Crosslinx Transit Solutions, work with City Transportation staff to review the work zone and determine the necessary traffic set up to ensure the site can be safely maneuvered by traffic and pedestrians. The traffic engineers also discuss other potential traffic flow solutions like temporarily alleviating neighbourhood restrictions and changing traffic signals with local decision-makers, including elected officials, Toronto Police Services, and the City of Toronto. These partners also keep on monitoring and making further adjustments in the vicinity of work zone if necessary. If any illegal driving behaviours and activities on your streets are witnessed, please report to the local police department who has the jurisdiction for enforcement. Who handles snow removal during construction? Our stations contractor, Crosslinx Transit Solutions, will handle the snow removal within construction zones, as well as roadways and sidewalks that have been impacted by construction. Sidewalks that are signed as closed will not be cleared during construction. Pedestrians are encouraged to follow the signed detours for their safety. Maintenance of sidewalks in the vicinity of work zones that are not affected by construction remains the responsibility of the City of Toronto. Please contact Toronto 311 to issue a request for those sidewalks. How do you ensure pedestrian access and sidewalk access? Pedestrian safety is of the utmost importance. During construction, there may be temporary detours and closures of sections of sidewalks to ensure that pedestrian routes are a safe distance from construction and easily usable for persons with accessibility needs. Pedestrian walkways will remain open for as far as possible and directional signage will be in place to help pedestrian traffic flow when there is a closure or detour in effect. Where necessary, for efficient pedestrian flow and safety, temporary crossing lights will be set-up. A sidewalk width of 1.5 metres will be maintained, as per the standards outlined in the Accessibility for Ontarians with Disabilities Act (AODA). Why are trees along Eglinton Avenue and some side streets being removed? Metrolinx and our stations constructor, Crosslinx Transit Solutions, will not take down trees unless it is necessary. Some trees, whether on public or private property, are in conflict with construction zones. We work closely with arborists to determine which trees can be removed, injured, or need to be protected before we act. We are required to obtain the appropriate permissions and permits from the City of Toronto for trees to be removed or injured. The replacement of private property trees is negotiated with the property owner. The replacement of public property trees is negotiated with the City of Toronto. Where is all the excavated soil going? This project will result in the displacement of approximately 1.8 million cubic metres of surplus excavated material generated by tunnelling and cut-and-cover construction at the portals, tunnel and stations. This material will be hauled by truck to licensed disposal sites. Will my garbage collection be affected by construction? Toronto Solid Waste Management Services will continue to pick up waste during construction of the Eglinton Crosstown LRT. Recycling and garbage collection schedules along Eglinton Avenue will not change. Please continue to abide by their guidelines and follow your normal routines. If necessary, your disposal containers may be temporarily moved to the edge of the work zone by the contractor. Please label your bins with your addresses and place them as close to the usual pick up location as possible. What is Metrolinx doing about rodent control during construction? Active construction sites may disrupt an existing stable nesting ground for rodents. As their habitat changes, they look for somewhere else to live. Because rodents live in extensive underground networks with many entrances and exits, it is difficult to control their migration. If you or your neighbourhood is experiencing a rodent control concern, please visit the City of Toronto rodent control webpage for more information. What is Metrolinx’s Community Benefits Program? local supplier and social enterprise opportunities, where possible. Why has Metrolinx included a Community Benefits Program in the Eglinton Crosstown LRT Project? Metrolinx recognizes that its major infrastructure investments should also provide benefits for the communities in which it works, including employment, apprenticeship, and local supplier opportunities, where possible. This is an excellent example of partnership and collaboration with government, business, labour and community partners, specifically the Toronto Community Benefits Network, the United Way Toronto & York Region, the Ministry of Advanced Education and Skills Development and Crosslinx Transit Solutions. More information on the Community Benefits Program and Plans can be found on the Community Benefits page. What is Crosslinx Transit Solutions? In July 2015, Crosslinx Transit Solutions was selected as the consortium to design, build, finance and maintain the Eglinton Crosstown LRT Project. Crosslinx Transit Solutions, the constructor of the Eglinton Crosstown LRT Project, is responsible for some of the hiring on the project. What is the role of Crosslinx Transit Solutions in the Community Benefits Program? Crosslinx Transit Solutions role is to design, build, finance and maintain the Eglinton Crosstown Light Rail Transit Project. As part of the Community Benefits commitments, its role is to provide prospects for historically disadvantaged communities and equity-seeking groups in the skilled trades, journeypersons, apprentices, Professional, Administrative and Technical positions, local business and social enterprise opportunities. What are the goals of Community Benefits & Liaison Plan? The goals of the Community Benefits & Liaison Plan are to provide community liaison to the communities impacted by design and construction of the Eglinton Crosstown Light Rail Transit Project. As well, to plan, organize and host events to enhance community awareness of employment opportunities and opportunities for the provisions of goods and services. And lastly, to develop and retain meaningful engagement with stakeholders. Who is Crosslinx working with on the Community Benefits Plan? Crosslinx Transit Solutions (CTS) partners with local workforce agencies and informs them of employment opportunities and initiatives. Those workforce agency networks include the City of Toronto Employment and Social Services, Employment Ontario, Toronto Community Benefits Network member agencies and the Consortium of Agencies Serving Internationally-trained Persons. How do I apply for jobs and/or procurement opportunities with the contractor? Crosslinx Transit Solutions is the contractor responsible for station construction, design and 30-year maintenance for the Eglinton Crosstown LRT. Information on procurement and employment opportunities are posted at www.crosslinxtransit.ca. You can also follow Crosslinx Transit Solutions on LinkedIn where positions they are actively recruiting for at any given time are posted. I want a job with Crosslinx; what do I do? If you are interested in a skilled trades opportunity (as an apprentice, or as a journeyperson) contact the union that represents the trade you would like to work with. All skilled trade workers on the Eglinton Crosstown Light Rail Transit Project are union members and are hired according to protocol. If you are interested in a non-skilled trade opportunity, your role/position will not be unionized. The Eglinton Crosstown LRT is a significant project with a long timeline, and works are completed in phases. Construction began in the summer of 2011. The project is expected to be complete in 2021. The first pair of tunnel boring machines began tunnelling from Keelesdale Park (at Black Creek Drive and Eglinton Avenue West) in the summer of 2013, working eastwards towards Yonge Street. They reached Yonge Street on May 2016. The second pair of tunnel boring machines began at Brentcliffe Road in fall 2015, working westwards towards Yonge Street. They reached their destination in August 2016. In 2015, work began on station construction. By the end of 2016, construction was underway at all 15 of the underground stations. How will the Crosstown benefit Toronto? The Eglinton Crosstown LRT will bring fast, reliable and convenient transit service to passengers across Toronto. It will carry many more passengers and be up to 60 percent faster than the existing bus service on Eglinton Avenue. In addition to moving people across the city more quickly, the Eglinton Crosstown LRT will ease traffic and congestion by providing a reliable travel alternative. The Eglinton Crosstown LRT project will create tens of thousands of jobs and provide lasting economic benefits for the entire region. Will the Crosstown be underground? The Eglinton Crosstown LRT line will be partially underground. The 19-kilometre route between Mount Dennis Station (Weston Road) and Kennedy Station will include a 10-kilometre underground portion in its central section between Keele Street and Laird Drive. The rest of the line will run at street level in a dedicated right-of-way transit lane, separate from regular traffic. 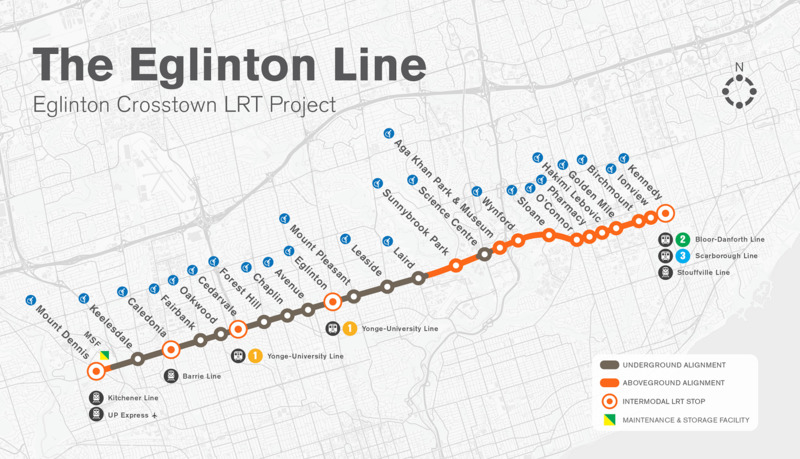 For a complete view of the Eglinton Crosstown LRT line, view the route map. Will all stations and vehicles be accessible to people with disabilities? Yes. Metrolinx is committed to providing fully accessible transportation facilities. The Crosstown stations and vehicles will be in compliance with the City of Toronto’s Accessibility Design Guidelines, Ontario Accessible Built Environment Standard, Ontario Building Code, and Ontario Human Rights Code. All Crosstown vehicles will be accessible with low floors and stations will include a main entrance with elevators and escalators. What are the hours of work permitted for this project? The City of Toronto passed a special by-law in 2010 to keep transit projects on time and budget. Mining and related work is permitted 24 hours a day, 7 days a week as part of a new city by-law for transit construction that extends the hours of work for station-related construction work. The construction work, per the by-law, is permitted to occur between 7:00 a.m. and 11:00 p.m., 7 days a week. Some overnight work may be required, which must go through the City of Toronto permitting process before proceeding. We recognize that this means a lot of construction activity taking place at one time, but noise and vibration monitoring equipment is in place to monitor levels and ensure that they are within acceptable legal limits. Every effort will be made to keep disruptions to a minimum, however, noise associated with construction and delivery and removal of materials can be expected at all sites. Why isn’t the Crosstown extending to the Toronto Pearson Airport? The section west of Mount Dennis was studied in the Crosstown Environmental Assessment; however, it is not part of the current Eglinton Crosstown LRT project and requires additional funding. Metrolinx, the City of Toronto and the TTC have undertaken a study of rapid transit options for the Eglinton West corridor to better understand people’s travel needs. The “Enhanced Eglinton West Rapid Transit” Initial Business Case Analysis was presented to the Metrolinx Board of Directors on June 28, 2016. The City of Toronto and Metrolinx continue to work to advance plans for the Eglinton West extension. When the Eglinton Crosstown is complete is 2021, passengers will be able to connect to the UP Express at Mount Dennis Station. Why don’t I see crews working at construction zones? The Eglinton Crosstown LRT is a large infrastructure project that requires long-term construction along Eglinton Avenue. The scale and complexity of the project means that many portions of work are linked and cannot necessarily happen at the same time. For example, completion of utility relocation work on one side of an intersection might depend on the construction timeframe of the adjacent side. Work is done in waves and round-the-clock work is not always appropriate. While one section may seem to take longer, another section might take less time than expected. What does utility relocation involve? Construction of the Eglinton Crosstown LRT requires utilities along Eglinton Avenue to be safely relocated. Depending on site conditions, gas, hydro, water main and sewer, cable, fibre and telephone lines may need to be diverted away to ensure safe excavation. Metrolinx and our contractor, Crosslinx Transit Solutions, coordinate with utility contractors (including Enbridge Gas, Toronto Water, and Toronto Hydro) to complete necessary work and notify the affected neighbourhood. General equipment used for utility relocation includes trucks and excavators. Some temporary lane reductions along Eglinton Avenue or the temporary closure of side streets may be required. How will the Eglinton Crosstown LRT line connect to existing transit lines? The Eglinton Crosstown LRT will be integrated with the TTC system and the GO Transit network. It will include seamless connections to 54 TTC bus routes, three subway stations, and three GO Transit rail lines, and the Union Pearson Express. Mount Dennis Station, at Weston Road, will include connections to the GO Transit Kitchener Line and the UP Express. Keelesdale Station, at Keele Street, will have a new bus bay. Caledonia Station, at Caledonia Road, is planned to connect with the GO Transit Barrie Line in the future. Cedarvale Station, at Allen Road, will connect with TTC Line 1 Yonge-University subway. Eglinton Station, at Yonge Street, will connect with TTC Line 1 Yonge-University subway. Science Centre Station, at Don Mills Road, will have a new bus bay. Kennedy Station, at Kennedy Road, will connect with TTC Line 2 Bloor-Danforth and Line 3 Scarborough, as well as the GO Transit Stouffville Line. What is light rail transit (LRT)? Light rail transit (LRT) provides fast, reliable and convenient service by carrying passengers in dedicated transit lanes separate from regular traffic. LRT is electrically powered, with near-zero emissions. See our LRT infographic to learn more. How is light rail transit (LRT) different from streetcars? Unlike streetcars, LRT runs in dedicated transit lanes, which ensure that LRTs are reliable and that travel times are more certain. Since LRT vehicles pick up passengers in their own lanes and on their own platforms, they do not delay other road traffic in the way that street cars do. LRVs also can carry more passengers than the average 74 person capacity streetcar. The capacity of each Eglinton Crosstown LRT vehicle is 163 people; each Eglinton Crosstown LRT train will consist of two to three vehicles, meaning a capacity of up to 490 people. For more information on LRT, see the LRT infographic. What type of noise or vibration may I experience once the Eglinton LRT is in operation? The Eglinton Crosstown LRT system is designed to meet the latest international reference standards for vibration control considering a range of sensitivities, including residences, office and commercial buildings, as well as special-purpose buildings such as concert halls, hospitals, and research and manufacturing facilities. The operations of the Eglinton Crosstown LRT line will adhere to the by-laws for noise in the City of Toronto the same way that the TTC operations do. What are you doing to support businesses impacted by construction? As such, Metrolinx has developed “Experience Eglinton”, a campaign to help local businesses promote themselves. The campaign provides support in the form of advertisements and promotional materials, as well as initiatives through partnerships to help businesses to improve their marketing skills. How much will it cost me to ride the Eglinton LRT line? Day-to-day operations of the Eglinton LRT line will be handled by the TTC. The specific fare has not yet been determined; but it is expected to be consistent with local transit fares in 2021. Stations and vehicles will be PRESTO-enabled. As of the end of 2016, PRESTO was available on all TTC subway stations, buses and streetcars.